This is the ultimate experience! 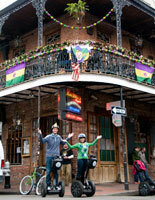 A Segway tour through America's most vibrant city! There is nothing like the culture of New Orleans. With it's European architecture, colorful history, and infectious culture, there's almost too much to explore. Why exhaust yourself walking when you can glide with a Segway? 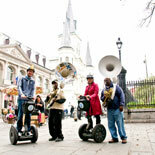 City Segway Tours of New Orleans is returning to the Crescent City! After being forced to close after Hurricane Katrina, they are excited to return to the city where they first opened in 2004. You can call it N'awlins, The Crescent City or The Big Easy but the locals will have you know that it is America's Most Interesting City. 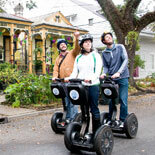 From buildings dating back to her French and Spanish colonial past, to the birthplace of Jazz, to night-life on Bourbon Street there certainly is a lot to take in, and the best way to do that is touring on a Segway with local guides. Imagine cruising effortlessly on a Segway through ' streets and squares and along the mighty Mississippi while receiving a great orientation, informative, historical and current-day information, heaps of unique and fascinating stories, fantastic photo ops and superb personal service from your guide. The Segway is the first of its kind: a self-balancing, personal transportation device that is designed to operate in any pedestrian environment. It's new. it's cool, and a ton of fun! City Segway Tours uses the new i2 machines! Reservations are required for all tours. The tours have limited size so you can count on a great personal and private experience. 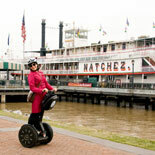 Discover what it is like to be a New Orleans celebrity as everyone, and we mean everyone, turns to watch you glide by! 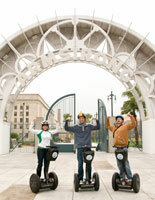 City Segway Tours is proud to be the first guided tour using Segways in the world. Be sure you glide with the original! Make your reservations and get your eTickets today! 3 Hour Tour-departs daily at 9:30am, 10:00am, 2:00pm and 2:30pm. 2 Hour Day Tour-departs at 11:00am and 3:30pm. 2 Hour Evening tour departs at 6:00 pm. Please arrive at least 15 min before departure time to fill out paperwork. Reservations are required in advance. E-Ticket will have details. Closed: New Year's Day, 4th of July, Thanksgiving Day & Christmas Day. All riders must be 12 years old to ride the Segway and weigh at least 100 pounds and not in excess of 260 pounds. They ask that the client arrive 15 minutes early for the scheduled tour to fill out necessary paperwork. All participants must be at least 12 years of age. Insurance requires that City Segway Tours pre-authorize $500 on a credit card. Please bring your American Express, MasterCard, Visa, Discover, or cash with you for this deposit. Each member of your party will be required to complete and sign a liability waiver form. For your riding safety, guests must weigh at least 100 pounds and not in excess of 260 pounds. Due to the risk to both child and mother, pregnant women are not allowed to participate on our Segway Tours. The tours operate rain or shine (at the discretion of City Segway Tours). We have rain ponchos available in our shop for $1 (refunded if not used). Anyone suspected of being under the influence of alcohol will not be permitted to ride, and will not be refunded. Minors (anyone under the age of 18) must be accompanied by an adult on the tour. Your safety is always their highest priority; therefore, we begin each tour with a very thorough orientation of the Segway and its use before going out to enjoy the city! Tours are in English. The tours operate in groups of 8. If the party is larger than 8 the group will be split up for safety reasons. City Segway Tours offers 100% refunds if the reservation is cancelled more than 72 hours (3 days) prior to the scheduled tour.